MIT is delighted to announce that as of the 1st April 2019 they have been appointed by Veth Propulsion to represent their Azimuth Thruster and Bow Thruster portfolio within the UK and Ireland marine markets and will officially launch the product set at Seawork 2019. Established in Papendrecht in the Netherlands, simplicity and quality is at the core of Veth’s design and manufacturing, operating as a leader in exceptional (auxiliary) propulsion systems since 1951. Acquired in 2018, Veth Propulsion now forms part of the Twin Disc Group of companies. With a reputation built on quality, Veth Propulsion is the ideal fit to the already extensive marine portfolio offered by MIT. The partnership only strengthens the choice of drive solutions available to naval architects, boat builders and operators, extending beyond a conventional driveline array with systems that offer an astonishing 360° of manoeuvrability. Suitable for a wide range of applications, Veth Propulsion solutions offer flexibility of design resulting in several available configurations. Along with traditional diesel power, the technology provided by Veth Propulsion is also able to be powered by environmentally friendly fully electric propulsion, putting more options in the hands of the end user. 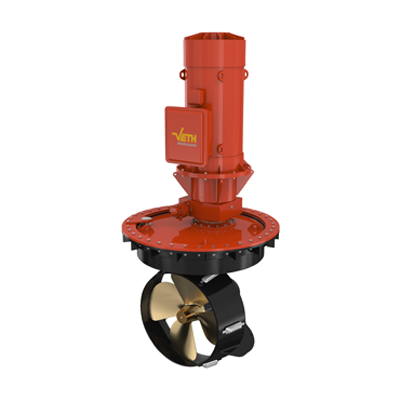 Aside from azimuth thrusters, Veth Propulsion has an extensive range of shallow draft horizontal bow thrusters which meet the requirements of a demanding marine market. With this unique design, users can expect high thrust even at cruising speeds along with 360° of thrust direction. The dynamic partnership of MIT and Veth Propulsion elevates bespoke propulsion with every application treated as an individual project, offering different drive options meeting the needs of specific build designs and vessel requirements whether the application calls for diesel-direct, diesel-electric / LNG-electric, hydraulic or a combination of these. Veth Propulsion has solutions for vessels including; Inland marine, Dredging, Seagoing vessels, Passenger vessels, Offshore, Ferries, Workboats & Tugs, Megayachts, Navy, Fishery and Towboats. MIT will officially launch Veth Propulsion at Seawork 2019, where on stand P05 they will display a true to life Integrated L-Drive model.